We finally succumbed to one of the recent food trends…chorizo. Neither of us really understand the point of food trends, because anything can taste good at any time. Cupcakes are still awesome, for those who say that the craze is over, fancy tacos were great 5 years ago, and pies, well, even our founding fathers loved pie- although they probably weren’t individual-sized and topped with bourbon spiked caramel sauce and crème anglaise! But chorizo is definitely something newer here in the United States (correct me if I’m wrong! ), especially to those who have not had much Spanish/Mexican cuisine in the past. It seems to have gone mainstream in the past couple years, judging by the number of recipes in Bon Appetit and Cookling Light! There have been several chorizo dishes we have been wanting to try, but it’s specialty ingredient that took us a while to find it in a store. 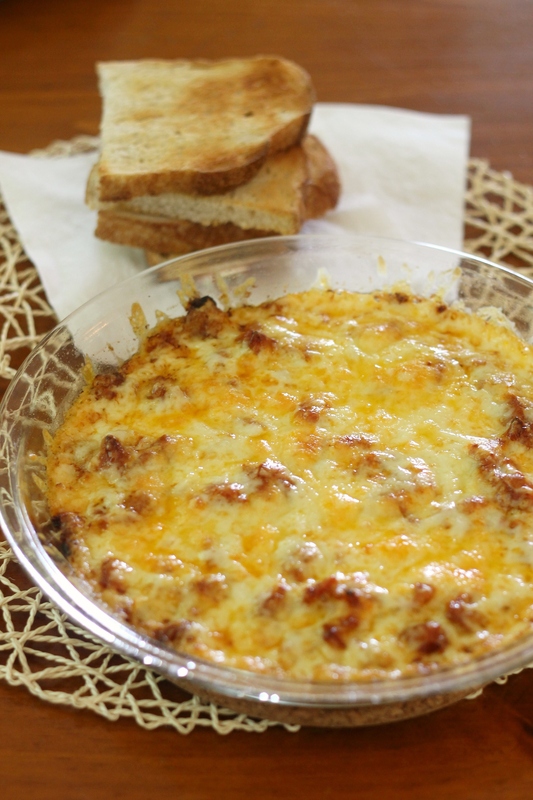 We recently settled on making this dip because it’s simple. However, the flavors are complex and wonderful for such an easy dish! White wine, caramelized onions, leeks, melted Gruyere cheese, and salty chorizo-yes, this stuff is fantastic. Unfortunately, it’s about as far from healthy as a dip can be, so we will not be making it often, but this is a fun dip to make for any summer gathering you might be hosting if foodies are involved (another food-related trend is the word “foodie.” I hate using it, but sometimes I do anyway because it is a useful word!). 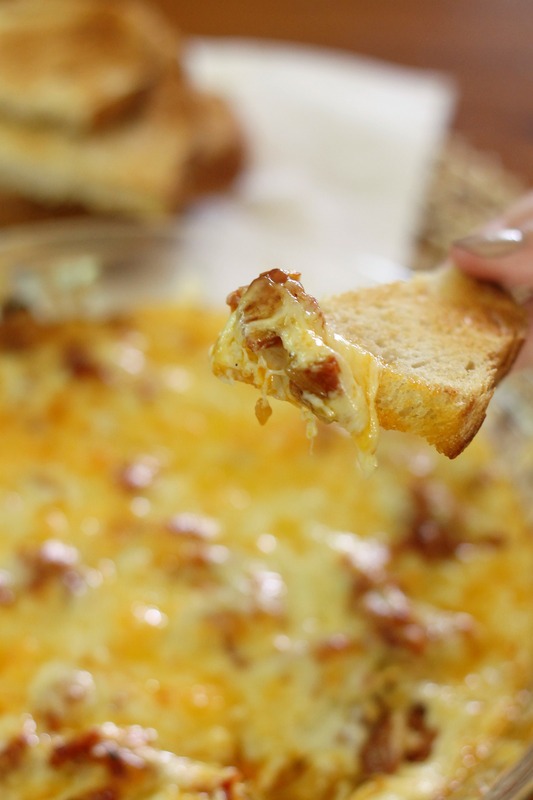 This dip is rather ugly to look at, but don’t let that deter you from making it! It is so, so good. Heat 1 1/2 tablespoons oil in large skillet over medium heat. Add onions. Sauté until deep golden brown, stirring often and adjusting heat as needed to prevent burning, 25 to 30 minutes. Season with salt and pepper. Meanwhile, heat remaining 1 tablespoon oil in medium skillet over medium heat. Add leeks and sauté 3 to 4 minutes. Add 3/4 cup water; cover and cook until leeks are tender, stirring often and adding more water by tablespoonfuls to moisten as needed, 10 to 15 minutes. Add wine. Cook uncovered until leeks are very soft, about 5 minutes longer. Season with salt and pepper. Combine onions and leeks in small bowl. Preheat oven to 450°F. Sauté the chorizo for 3-5 minutes until some of the fat has been released; drain (see note below). Divide onion-leek mixture among 4 small gratin dishes (or one larger dish, which is what we did). Top mixture in each dish with chorizo slices, then cheese. Bake until cheese melts and bubbles, about 15 minutes. Serve hot with grilled bread. Enjoy! Note: We learned that the chorizo releases quite a bit of grease when baked, so we had to wick it off the top with a paper towel. We would recommend either microwaving it for a minute or two between some paper towels or pan frying it first to release some of the grease as indicated above in the directions. We have not personally tried these methods yet, but next time we make the dip we certainly will and we will update the directions. This looks crazy good! Definitely going to try it! !